:Rose Schrock is a plain woman with a simple plan. Determined to find a way to support her family and pay off her late husband's debts, she sets to work to convert the basement of her Amish farmhouse into an inn. While her family, especially her cranky mother-in-law, is unhappy with Rose's big idea, her friend and neighbor, Galen King, supports the decision and he helps with the conversion. As Rose finalizes preparations for visitors, she prays. She asks God to bless each guest who stays at the Inn at Eagle Hill. As the first guest arrives and settles in, Rose is surprised to discover that her entire family is the one who receives the blessings, in the most unexpected ways. And she's even more surprised when that guest decides to play matchmaker for Galen King. 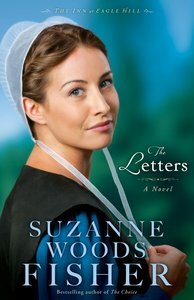 About "The Letters (#01 in The Inn At Eagle Hill Series)"
Customer Reviews For "The Letters (#01 in The Inn At Eagle Hill Series)"
Set in the deceptively quiet community of Stoney Ridge, these three novels centre on an Amish farmhouse converted into an inn by Rose Schrock. Suzanne Woods Fisher delivers pacy storylines with twists and turns and just the right dose of tender romance!